YouTube has a large number of active users. Thousands of videos are posted on this video sharing platform and is the most chosen by marketers who want to promote their service or product. Whatsapp Marketing is also need to promote YouTube videos so that it will help for the boost of the business and the marketing strategy becomes a big success. YouTube marketing videos can be promoted on various social networking sites including Whatsapp. 2. You can share the YouTube video on Whatsapp using the mail option and mobile camera features. 3. Sharing the YouTube video on WhatsApp helps to reach many consumers. 4. WhatsApp has a large number of active users and there are high chances that these will see the video and visit your business website. 5. 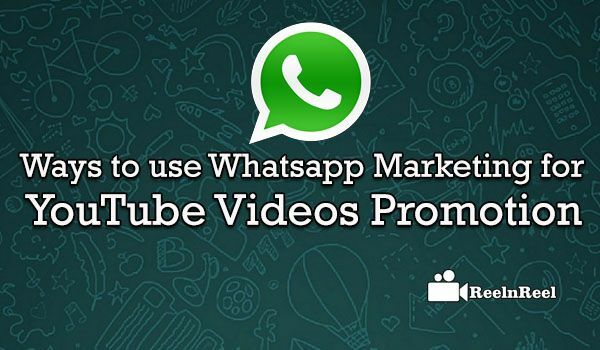 The conversion rate can be higher if you share your YouTube video on Whatsapp. 6. WhatsApp broadcasting feature helps to send the YouTube videos or video links to a group of people. This helps the marketers to reach large numbers of WhatsApp users. 7. Send the marketing videos of your products to your clients on WhatsApp as this is an effective tool for interacting with the customers. 8. The videos that are posted on WhatsApp are shareable. 9. Post your YouTube videos on Whatsapp for quick, affordable and high penetration business promotion. 10. The YouTube videos that are explainer videos of products etc can be posted to engage the customers. From a simple app that helps for sharing pictures and videos, WhatsApp has come a long way and has become an important tool for marketing for promotion various things such as products, services and YouTube videos. WhatsApp active users are more than one billion and this has become one of the effective platforms for marketing.